“It’s close to midnight, something adorable’s lurking in the dark,” sang Michael Jackson – well, sort of. Halloween is a time for trick-or-treating, candy, skeletons and ghouls. It’s a time when people feel free to dress as everything from movie stars to this year’s hottest meme, to a political reference, but mostly as cats. But what about cats themselves? Don’t they want to join in with the festivities? Don’t they want to go out into the world in disguise and cause mischief and merriment? Well, worry about them no more. 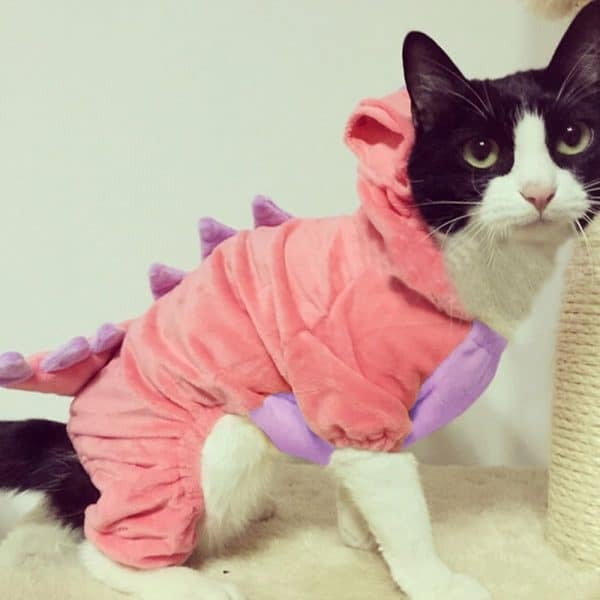 Luckily there’s a whole load of fun costumes you can get for your cat – and in this article, we’ll be answering the question that’s been on all of your lips: What are the best Halloween costumes for cats? This is the sort of costume that is so good, once you put it on your feline companion, you probably won’t want to take it off, ever. 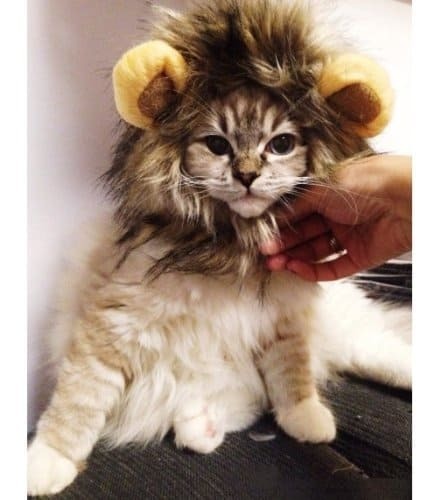 It turns your cat into a fierce lion with the simple addition of a bushy mane. It’s a soft fabric, with an adjustable neck for even the tiniest of cats. It doesn’t constrict, and much like their collars, they can get them off if they need to or if they get it caught on something. As long as it suits the color of your cat, you’re good to go (maybe even if it doesn’t! 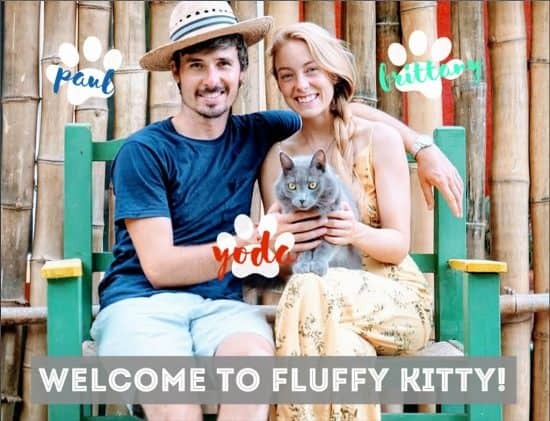 Even if you don’t like the thought of getting one for yourself, it’s worth looking just to see the hilarious pictures of other people’s cats wearing them. Paging Doctor Meow, we have a cute-emergency in the ICU. This is one of the best human profession Halloween costumes for cats around. Covering their front legs, their neck, and head, it is the illusion of a two-legged doctor with a big flowing lab coat striding around the hospital walls. A guaranteed chuckle, this costume really has taken the Hippocratic oath to do no harm, except to your sides when they split from laughter. 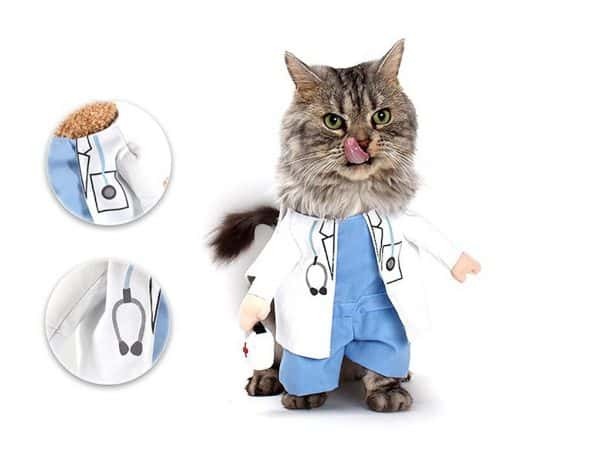 Lower your blood pressure with this furry little medical professional! Don’t let the picture fool you, that cat is having the time of its life now that it’s in a world where it’s sailing the seven seas. 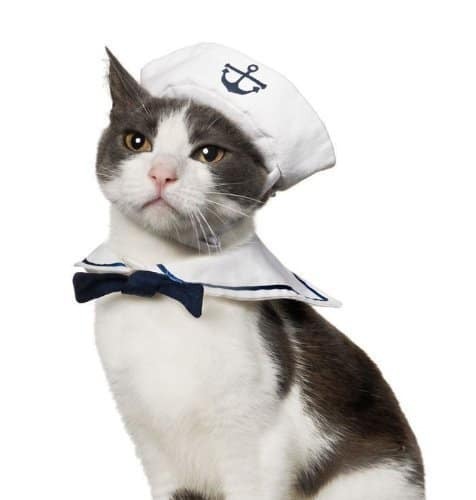 When the costume provides an absolutely adorable sailors hat combined with a neckerchief, rarely has a cat looked either this smart or this well turned out. You’ll be waving him away at the docks as he gets carried away and goes off in search of adventure in no time. One of the best Halloween costumes for cats we’ve ever had the fortune of SEA-ing. Avast! Maybe your cat is more of a brigand than a gentleman when it comes to sailing the high seas? Then channel their inner Jack Sparrow with this Halloween costume! The only difference between a pirate and a privateer is the recognition of the Lord of the land, but who cares when you look this adorable? Very similar in concept to the doctor outfit, this is a front-ended uniform meant for only the most feared captains with an amazing jolly roger hat, and a sassy hook hand to let you know that he or she means business. Just make sure you buy it a bit bigger than you need as the sizes run a little small. 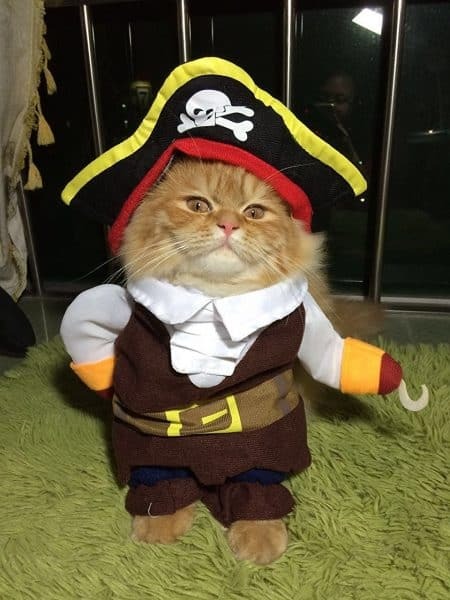 He’s coming to your shores very soon for your plunder, your booty, and your catnip. Looking for something a little more relevant? Need another cosplayer to round out your Star Wars gang? Look no further than your beloved family pet. 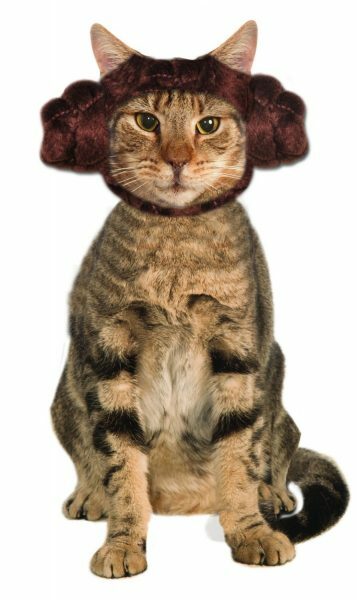 Although you’d think a Chewbacca hat would suit their fur better, the dignity it gives off in this Leia Halloween costume for cats is positively purrfect. Who’d have thought two hair buns would turn this little princess into, well, an actual princess? Reach for the sky! If you’re not laughing at this Halloween costume, you’re not living. 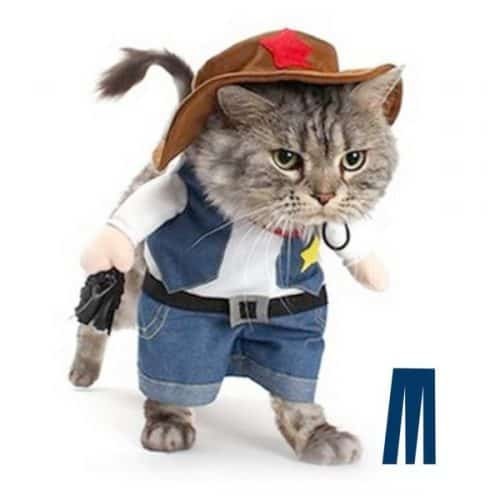 Look, we all know that cats are the boss of the house, so why not just make that completely official with the addition of a 10-gallon hat and a Sheriff’s badge. With this Halloween costume, your cat is guaranteed to clean up this town (your backyard) and send those bandits (mice, voles, moles, squirrels, and small birds) running for the hills. Say howdy to the rootiest-tootiest little cowboy on the range, ma’am. One of the absolute best Halloween costumes for cats around. Look out, people of TinyTown, USA! Godzilla cat is coming to run rampage down Main Street. This snug onesie is absolutely adorable, quite warm, and allows you to reenact Jurassic Park in your own living room. At least when this little beast is tearing around your living room and shredding the furniture, you’ll have a little bit more understanding to forgive it- after all, it is a dinosaur. 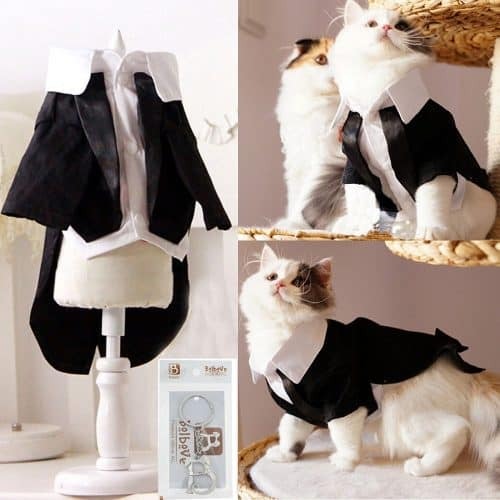 Turn your cat into a suave and sophisticated James Bond with this absolutely adorable tuxedo. While it’s a great Halloween costume for cats, it could also double up as the outfit your pet wears when you become a supervillain and try to take over the world. It’s a snug fit, and a stiff material (as you might imagine). Warning: may make your cat better dressed than you. That’s just a small selection of the best Halloween costumes for cats available on the market. Since the early day’s, cats have been the mythical best friend of witches and pharaohs, so who knows better about ancient magic, spells and the spirit of Halloween than them? 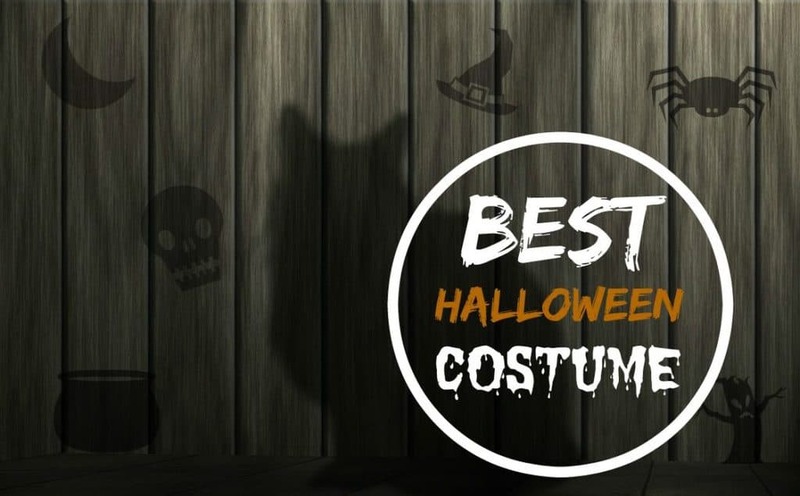 Now with these costumes, your cat can finally get in on all of the spooky, family-fun action, and doubtless take back all of the candy on the trick-or-treat run with these heartwarming and absolutely hilarious outfits.